First phase of the Tethys Ocean's forming: the (first) Tethys Sea starts dividing Pangaea into two supercontinents, Laurasia and Gondwana. The Tethys Ocean /ˈtiːθɪs/ (Greek: Τηθύς Tēthús), also called the Tethys Sea or the Neotethys, was an ocean during much of the Mesozoic Era located between the ancient continents of Gondwana and Laurasia, before the opening of the Indian and Atlantic oceans during the Cretaceous Period. The name stems from the mythological Greek sea goddess Tethys, sister and consort of Oceanus, mother of the great rivers, lakes, and fountains of the world and of the Oceanid sea nymphs. The eastern part of the Tethys Ocean is sometimes referred to as Eastern Tethys. The western part of the Tethys Ocean is called Tethys Sea, Western Tethys Ocean, or Paratethys or Alpine Tethys Ocean. The Black, Caspian, and Aral seas are thought to be its crustal remains, though the Black Sea may, in fact, be a remnant of the older Paleo-Tethys Ocean. The Western Tethys was not simply a single open ocean. It covered many small plates, Cretaceous island arcs, and microcontinents. Many small oceanic basins (Valais Ocean, Piemont-Liguria Ocean, Meliata Ocean) were separated from each other by continental terranes on the Alboran, Iberian, and Apulian plates. The high sea level in the Mesozoic flooded most of these continental domains, forming shallow seas. As theories have improved, scientists have extended the "Tethys" name to refer to three similar oceans that preceded it, separating the continental terranes: in Asia, the Paleo-Tethys (Devonian–Triassic), Meso-Tethys (late Early Permian–Late Cretaceous), and Ceno-Tethy (Late-Triassic–Cenozoic) are recognized. Neither Tethys Ocean should be confused with the Rheic Ocean, which existed to the west of them in the Silurian Period. To the north of the Tethys, the then-land mass was called Angaraland and to the south of it, it was called Gondwanaland. From the Ediacaran (600 Mya) into the Devonian (360 Mya), the Proto-Tethys Ocean existed and was situated between Baltica and Laurentia to the north and Gondwana to the south. From the Silurian (440 Mya) through the Jurassic periods, the Paleo-Tethys Ocean existed between the Hunic terranes and Gondwana. Over a period of 400 million years, continental terranes intermittently separated from Gondwana in the Southern Hemisphere to migrate northward to form Asia in the Northern Hemisphere. During the Oligocene (33.9 to 23 Mya), large parts of central and eastern Europe were covered by a northern branch of the Tethys Ocean, called the Paratethys. The Paratethys was separated from the Tethys with the formation of the Alps, Carpathians, Dinarides, Taurus, and Elburz mountains during the Alpine orogeny. During the late Miocene, the Paratethys gradually disappeared, and became an isolated inland sea. 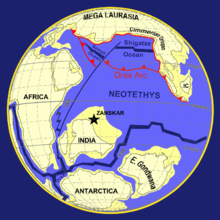 In 1885, the Austrian palaeontologist Melchior Neumayr deduced the existence of the Tethys Ocean from Mesozoic marine sediments and their distribution, calling his concept Zentrales Mittelmeer and described it as a Jurassic seaway, which extended from the Caribbean to the Himalayas. 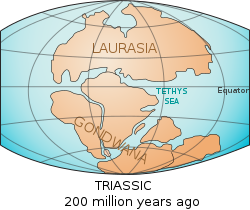 In 1893, the Austrian geologist Eduard Suess proposed the theory that an ancient and extinct inland sea had once existed between Laurasia and the continents which formed Gondwana II. He named it the Tethys Sea after the Greek sea goddess Tethys. He provided evidence for his theory using fossil records from the Alps and Africa. 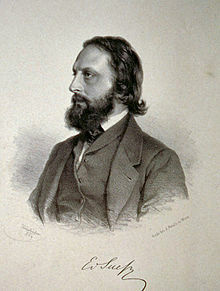 He proposed the concept of Tethys in his four-volume work Das Antlitz der Erde (The Face of the Earth). In the following decades during the 20th century, "mobilist" geologists such as Uhlig (1911), Diener (1925), and Daque (1926) regarded Tethys as a large trough between two supercontinents which lasted from the late Palaeozoic until continental fragments derived from Gondwana obliterated it. After World War II, Tethys was described as a triangular ocean with a wide eastern end. From 1920s to the 1960s, "fixist" geologists, however, regarded Tethys as a composite trough, which evolved through a series of orogenic cycles. They used the terms 'Paleotethys', 'Mesotethys', and 'Neotethys' for the Caledonian, Variscan, and Alpine orogenies, respectively. 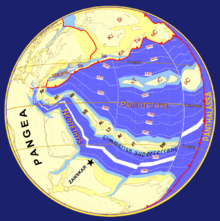 In the 1970s and '80s, these terms and 'Proto-Tethys', were used in different senses by various authors, but the concept of a single ocean wedging into Pangea from the east, roughly where Suess first proposed it, remained. In the 1960s, the theory of plate tectonics became established, and Suess's "sea" could clearly be seen to have been an ocean. Plate tectonics provided an explanation for the mechanism by which the former ocean disappeared: oceanic crust can subduct under continental crust. Tethys was considered an oceanic plate by Smith (1971); Dewey, Pitman, Ryan and Bonnin (1973); Laubscher and Bernoulli (1973); and Bijou-Duval, Dercourt and Pichon (1977). ^ Van der Voo, Rob (1993). Paleomagnetism of the Atlantic, Tethys and Iapetus Oceans. Cambridge University Press. doi:10.2277/0521612098. ISBN 978-0-521-61209-8. ^ Suess 1893, p. 183: "This ocean we designate by the name "Tethys" after the sister and consort of Oceanus. The latest successor of the Tethyan Sea is the present Mediterranean." ^ Suess 1901, Gondwana-Land und Tethys, p. 25: "Dasselbe wurde von Neumayr das 'centrale Mittelmeer' genannt und wird hier mit dem Namen Tethys bezeichnet werden. Das heutige europäische Mittelmeer ist ein Rest der Tethys." Kollmann, H. A. (1992). "Tethys—the Evolution of an Idea". In Kollmann, H. A.; Zapfe, H. New Aspects on Tethyan Cretaceous Fossil Assemblages. Springer-Verlag reprint ed. 1992. pp. 9–14. ISBN 978-0387865553. OCLC 27717529. Retrieved 6 October 2015. Metcalfe, I. (1999). "The ancient Tethys oceans of Asia: How many? How old? How deep? How wide?". UNEAC Asia Papers. 1: 1–9. Retrieved 6 October 2015. Metcalfe, I. (2013). "Gondwana dispersion and Asian accretion: tectonic and palaeogeographic evolution of eastern Tethys". Journal of Asian Earth Sciences. 66: 1–33. Bibcode:2013JAESc..66....1M. doi:10.1016/j.jseaes.2012.12.020. Retrieved 6 October 2015. Stampfli, G. M.; Borel, G. D. (2002). "A plate tectonic model for the Paleozoic and Mesozoic constrained by dynamic plate boundaries and restored synthetic oceanic isochrons". Earth and Planetary Science Letters. 196 (1): 17–33. Bibcode:2002E&PSL.196...17S. doi:10.1016/S0012-821X(01)00588-X. Suess, E. (1893). "Are ocean depths permanent?". Natural Science: A Monthly Review of Scientific Progress. 2. London. pp. 180–187. Retrieved 6 October 2015. Suess, E. (1901). Der Antlitz der Erde (in German). 3. Wien F. Tempsky. Retrieved 6 October 2015.